When Hurricane Harvey hit Houston earlier this year and we saw thousands of people being displaced and facing such loss and difficulty, our community's and our country's response was "How can I help?" At Paint Love, we bring transformational art experiences to children and teens facing poverty and trauma and our team knew the programming and services of Paint Love could be our way of helping. We put an ask out to the Paint Love community of "who wants to be involved?" and we got such a supportive response. After considering the best way to bring what we do to Houston, we decided to follow our own model in Atlanta of connecting artists with nonprofits and see if there were any artists and volunteers in Houston that were interested in service but needed logistical and resource support. Through email exchanges with the Houston Arts Alliance, Galveston Arts Center and other great arts organizations on the ground we were connected to Meghan Hendley-Lopez and her husband Felipe (together they run fmhelps.me) who were working to organize artists, mostly musicians at the time, to serve at the NRG center. From there we started talking about project needs and came up with a plan. We decided to take two of our favorite projects from Atlanta that work well with groups of people and foster a sense of community to Houston. Our second project, which we brought to the Children's Museum of Houston with the help of Jerry's Artarama, Meghan, Felipe, and Andrew Karnavas (of Andyroo and the Andyrooniverse) during their free admission day, was a collaborative mural project we first did with Paint Love artist Morgan Corbett here. With suggestions from Meghan, our executive director, Julie McKevitt, created a #Houstonstrong skyline design. We invited 192 children and families to join us in painting the piece together! The mural was a huge success!! We are honored to have created such wonderful partnerships and for the opportunity to work side by side with community members and artists in Houston! Based, in metro-Atlanta, Paint Love connects artists and organizations in the community for a positive impact on youth. Yesterday's project at Norton Park Elementary School kicked off Paint Love's fall event schedule! What a wonderful way to start the season! We are thrilled to be making an impact in our local community and partnering with such amazing artists and organizations. Paint Love artist, Morgan Corbett, led a group project for 3rd and 4th graders at Norton Park. 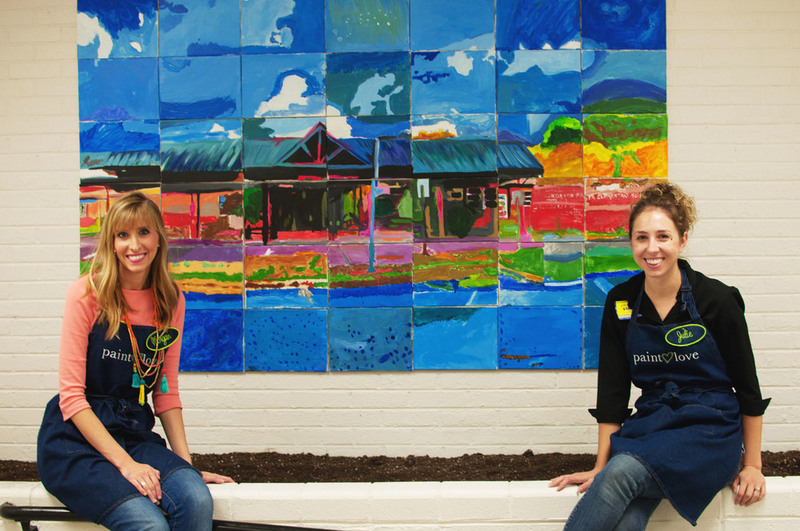 Together, they created a large painting to hang in their school. Norton Park Elementary is a Title 1 School, where 92%-93% of their student population is on a free-reduced lunch program. With limited resources for guest artists, Norton Park's Art Teacher, Sabrina Barilone reached out to Paint Love to provide a fun and unique art experience for their students. We were thrilled to be involved! Many of the students in the class had not worked on canvas before, so Morgan, with insight from Ms. Barilone and support from Norton Park Principal, Doug Daugherty decided to do a mural painting on canvases that would be hung in the school. Morgan suggested painting of picture of the school building. Morgan, an art teacher herself and professional photographer, used photoshop to manipulate photos of the school to create a bright and colorful reference photo for the students to paint (in a style similar to Pop Art works by Andy Warhol). She gridded the photo into 42 sections and gave each student a piece of the picture to paint on their canvas. What resulted was beautiful! With less than 2 hours with the group of students, Morgan taught the students about Andy Warhol, acrylic paint, and the concept of painting on stretched canvases. She demonstrated how to draw out their piece of the picture and mix the paint for their canvas. The students were amazing. Their attention to detail, patience, and welcoming hearts made the project so successful. The supportive environment and artistic foundation Ms. Barilone had created in her art room certainly paved the way for us to step in for a day and make something so wonderful! As the students finished their piece of the "puzzle", we laid the canvases outside the window, so they could begin to see their picture come together. They were so excited about seeing their work in the school. After the canvases were complete, we hung them together on the wall. We hope this is a piece the students, teachers, and staff at Norton Park will enjoy for a long time! Principal Daugherty commented on the event saying, "This was a win-win for our school and students. Paint Love was gracious in their time and resources spent with our students. Without their willingness and kind hearts, our students would not have been able to be part of a creating a wonderful, modern piece of art that is the talk of the school. And it was more than just painting for them. It was educational, inspirational, and rewarding. Paint Love is to be commended for being able to bring those experiences to students. Their mark on our students will be reflected and honored each time a student, teacher, or parent walk by the amazing student created mural painting that will brighten our halls for years to come." When discussing this week's event, Paint Love artist, Morgan Corbett noted, "I am thrilled I had the opportunity to impact these students in a creative way! It was so meaningful to me that we were able to give these students a unique art making experience that they might not have otherwise. Paint Love is doing great things in Atlanta and I love being a part of it!" We want to say a quick thank you to all of the wonderful individuals and families who made this project possible. Thank you so much for the amazing support Sabrina Barilone and Principal Doug Daugherty provided. They have created such a loving and inspiring environment for their students! We want to say thank you to the parent volunteers that came in to help us during our event. A special thank you to the Noel family for donating canvases and to Julie Ann McKevitt for donating the remaining canvases, paints, and brushes to Paint Love. And finally, a big THANK YOU to our artist Morgan Corbett. Without the love, time, and creativity of our Paint Love artists, we would not be able to go and love on so many local students!